Here’s another great guest post by the team at Mirai Espana, this time by Pablo Delgado and César López. This post examines how 3rd Party Retailers / OTAs capture business intended directly for hotels…and how to approach / fix the problem. Also evaluated is the value OTAs CAN add, i.e. via generic and destination level searches. 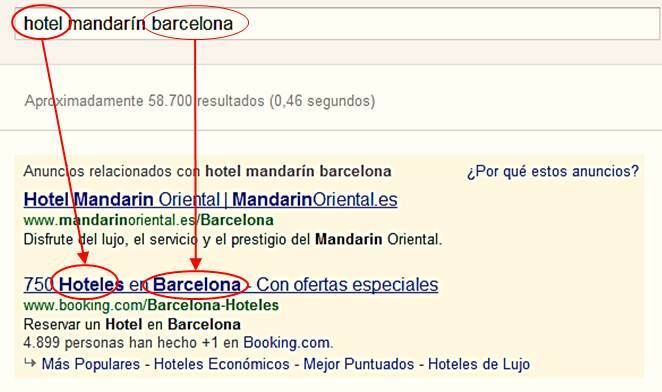 In Continental Europe, hotels with registered trademarks can prevent intermediaries from using their brand names in Google Adwords. Doing this means that more users end up on their own websites. In spite of the advantages, most independent hotels don’t take the necessary steps to benefit from it. Did you think you were first in line? Others are cutting in front of you. Although the official website is the first in “organic” or natural search results, it has up to three sponsored links (adword advertisements) above and to the right of your advertisement. Google is continuously making their advertisements more visible, to the detriment of natural search results, so the situation is just getting worse with time. We’re referring to the person that is searching you by name, your brand: Somehow, this person already knows that you exist and is looking for more information about you. You’ve already won half the battle. Your website should be the logical destination (how he or she gets to you) and where a reservation is made. Of course, your website must be attractive, convincing and offer the best, not only in terms of information, photos and content but also in price and access to the last room. Those who search for a hotel in your city don’t not know you exist. They are at an earlier stage. It is a common occurrence nowadays. The hotel chains and the more advanced, independent hotels have already accepted the need to invest in advertising their website, in the same way that they pay for this through intermediaries. That investment has a well-known return, very accurately measurable and above all, acceptable in the majority of cases, lower than the typical costs of intermediaries, which we have studied some months ago. Google charges its advertisements based on the number of companies willing to pay. Like the intermediaries that you have hired they willingly pay. Competition is established through bidding. Pooking.com and its affiliates have the right, only for the purposes of merchandising, promotional and reception of hotel reservations, to use the names, logos, trademarks and hotel photos taken from the official website as well as personally obtained. Espiria has the right to promote the hotel using its name(s) for the purposes of online marketing, including marketing via e-mail and pay per click (PPC) publicity. You should avoid this and ask that they modify the contract so that you reserve the right to deny certain uses of your name. Are you already tied down by contract? Then ask them in a friendly way. Get in contact with them. It is important that they see that you are decided and that you know the rules. 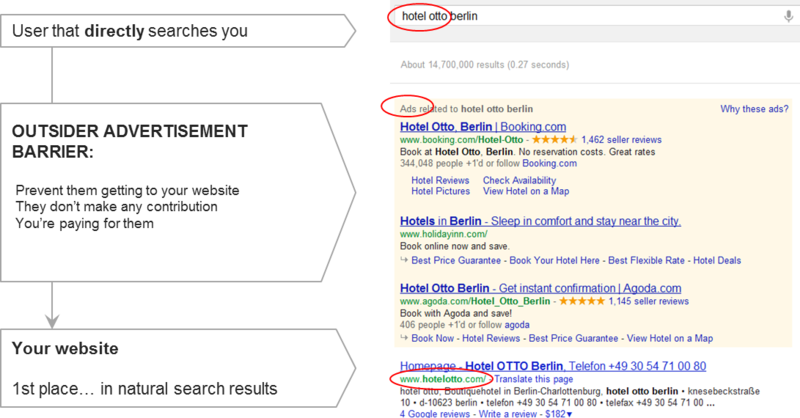 I would be very grateful if you could stop investing in Adword advertisements for searches using the name of my hotel. This situation is not in accordance with point 1 published by the European Association of Hotels in its benchmark of fair practices* with online distribution. I am sure a company with your level of prestige will understand the need to respect this fact which you can read in the referenced document. “Yes”. There are those that, although they do not like it, they will understand your opinion and they will carry out your request. They are usually the minority but the most professional and serious. According to our knowledge, it appears to be the case of Booking.com. “No”. Those that do not agree with you whatsoever responding with vague or absurd excuses knowing that they call the shots due to having a signed contract. They ignore you. Those that don’t even respond, clearly hoping that you quit requesting and forget about the issue. And when the following is the answer? Dear customer, thank you for the screenshots. We can see that there are links sponsored by other companies apart from the hotel website. We can therefore not do anything since we are not the only ones. Kind regards. (Exact text from a real response). Request that they stop the advertisements for a period of time (4-6 weeks) in such a way that it gives you time to contact all the other channels to request the same. It is a lot of work to keep insisting but at least it is an intermediate outlet. Remember that you can not demand anything. You have signed a contract. When renewing the contract you will call the shots again. Galahotels.com? Is it offering your hotel and you don’t know who it is? They are affiliates of some intermediary or IDS you were working with. Booking.com or Expedia have thousands. Discover who is behind it, perhaps making yourself a fictitious reservation that you can cancel. Get in contact with the intermediary that you hired. 2, Websites that bid on your name/trademark but do not offer reservations but rather other services like price comparison or customer evaluations. Trivago, Kayak,Tripadvisor… They do not directly sell but they do connect with dozens of intermediary websites and charge big commissions in exchange. They behave like affiliates although technically they are not. Directly demand that they stop. You will come across responses like this: “Your hotel is on the internet and therefore I have the right to advertise it”. Due to not having hired anybody nor being able to close sales with them, the solution is not easy and it goes through a legal process which we will now speak about. Comparing how they deal with certain hotels and others, it is clear that they have different policies. There are hotels with which they make clear exceptions (and they make generic advertisements or they directly stop making advertisements) while with others they shamelessly bid on the name of the hotel. 3, Websites that offer another product that is not your hotel (this action is prohibited by law. We will not deal with this category, we recommend that you speak with them and, if this does not work, report them). “Google recognises the importance of the commercial trademarks. 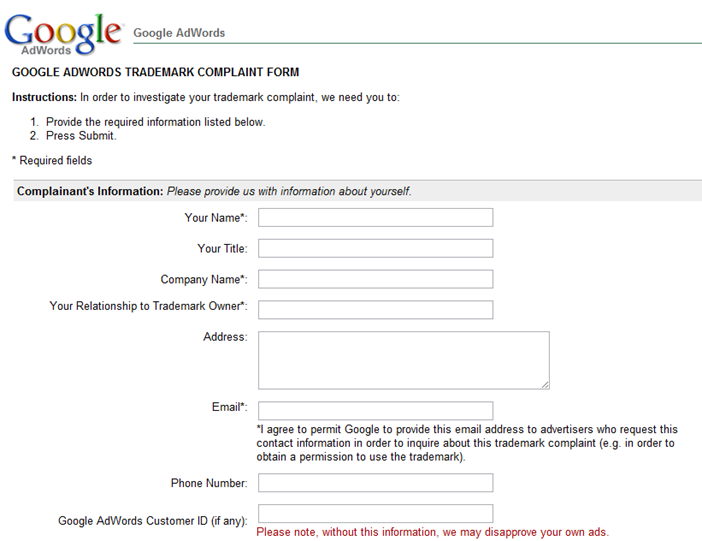 The Terms and conditions of AdWords prohibits the infringement of copyright on behalf of the advertisers. The advertisers are therefore responsible for both the key words they choose to create advertisements and the text they use in them”. Therefore any business that has a registered trademark has the right to notify Google and prohibit the use of said trademark in paying advertisements. This includes, since it is the only way, all the cases we have spoken of, hired intermediaries, affiliates, price comparison websites, review and competence websites. They are all treated the same. In “Authorised Entities” write the names of the companies (along with their customer ID’s) which you authorize to create Adwords using your account. 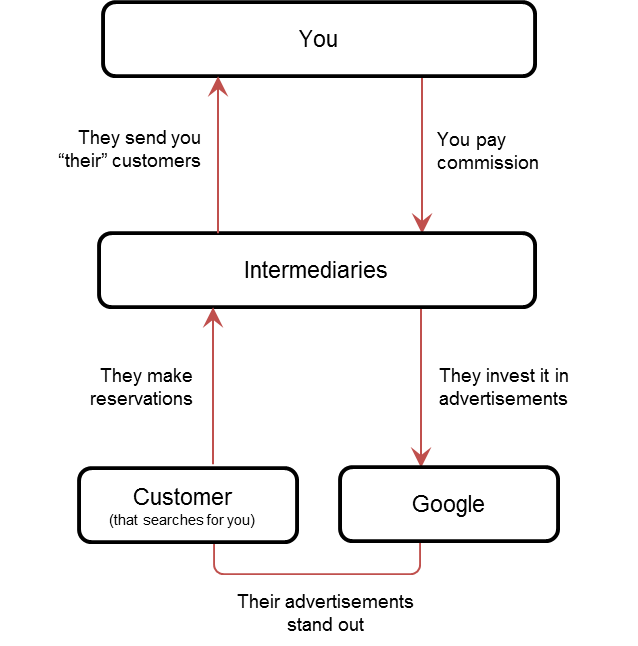 This applies to you if you have sub-hired the Adwords service. Google shows advertisements according to the words that the user has written… every single one of the words. You can prevent advertisements appearing when your names is searched or advertisements that include your name in their text but you cannot do anything about advertisements that appear due to rest of the words used in the search. Although you cannot avoid these advertisements, they are less effective because they speak about hotels in a particular location and not a specific hotel that the user is searching for. This advertisement from Booking.com does not appear due to having searched “mandarin” but rather for having written “hotel” and “Munich.” Notice that it does not include any reference to “mandarin.” It has been prohibited. 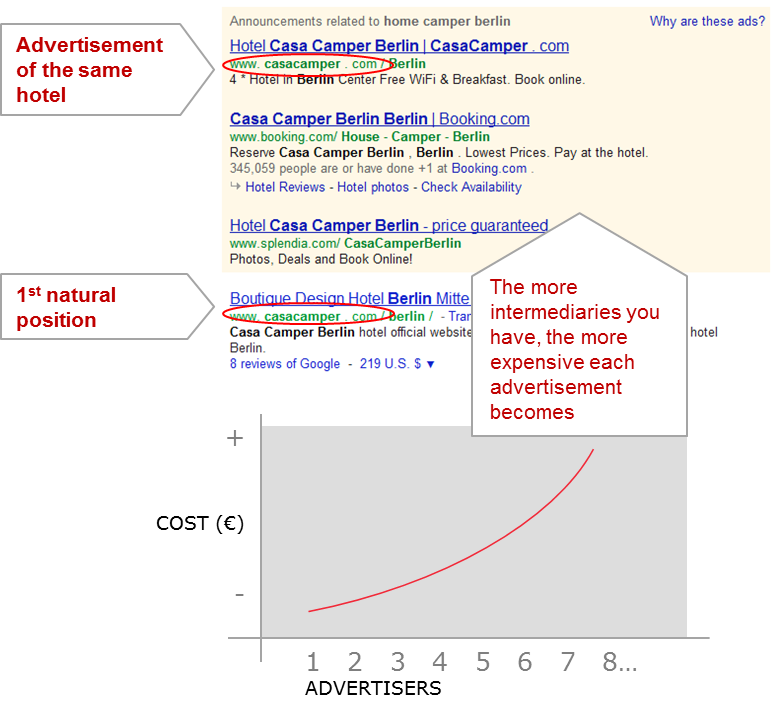 Without intermediary advertisements you get the maximum visibility when a user searches for your hotel. If your bet is decided by your official website, you can continue advertising yourself (finally, just you). They will be much cheaper than before since you won’t have competitors bidding. 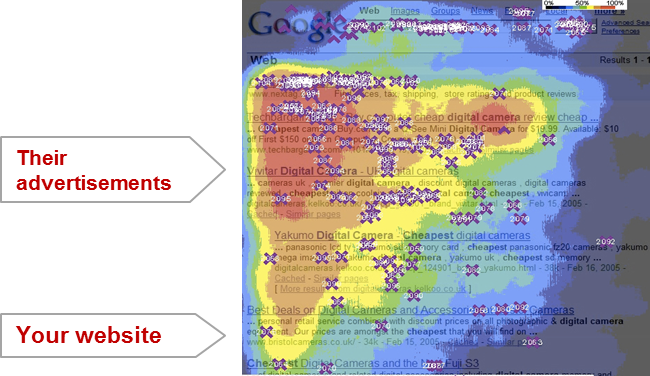 You distance yourself from intermediaries and competitors and push them towards the bottom of the search page. 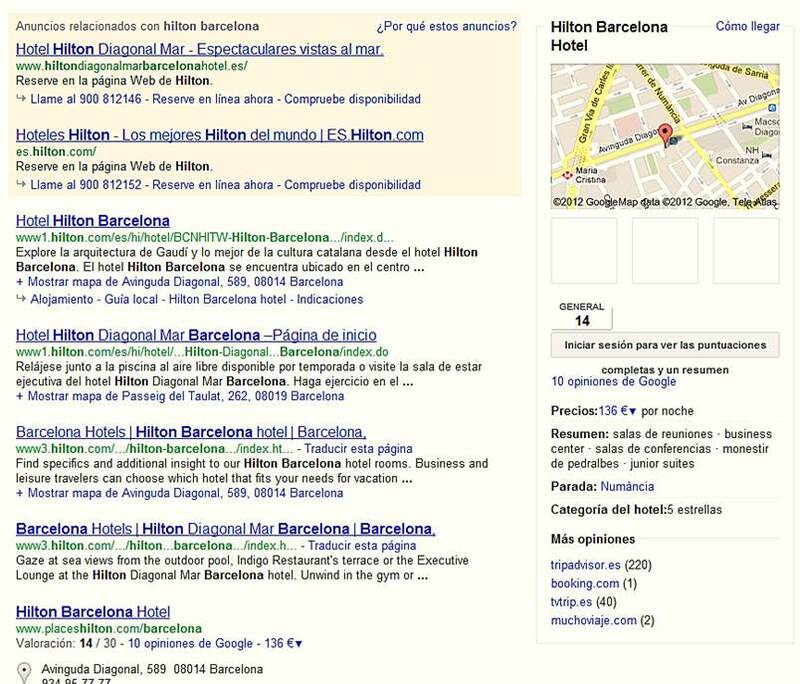 In the screenshot above, you can see how Hilton manages to cover the entire search results page with nothing but its own websites. – Pablo Delgado and César López work with Mirai, found at www.miraiespana.com. Excellent article. This can really help level the playing field for independent hotels. Hi, Enjoyed reading every bit of it. To the point and very informative for young professionals like us. Thank you. Indeed a very useful Article!